The 2006 Jeep Grand Cherokee. The president of a Massachusetts auto auction has been charged with five counts of manslaughter after a 2017 auction-lane accident that killed five people. Indictments issued Thursday by the Middlesex County District Attorney against James Lamb and Lynnway Auto Auction allege they are criminally responsible for failing to take appropriate actions that could have prevented the deaths. 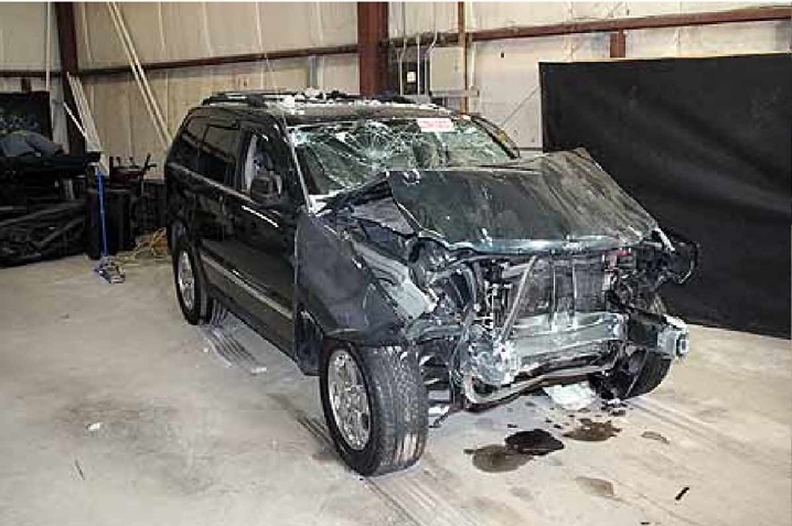 On May 3, 2017, a 2006 Jeep Grand Cherokee driven by a 77-year-old employee suddenly accelerated, hitting several people before crashing through a cinder block wall. In addition to the five fatalities at the Billerica, Mass., auction, nine people were injured and hospitalized. Middlesex County District Attorney Marian Ryan said the auction company and Lamb were aware of the shortfalls in safety measures in place at the auction and that they failed to ensure that all drivers were licensed and trained. Ryan noted a 2014 incident in which a worker was seriously injured and that the Occupational Safety and Health Administration has visited and monitored the auction several times. "Following the incident in 2014, recommendations were made to Mr. Lamb, particularly with respect to providing actual barriers between what was later determined to be this driving lane and pedestrian lane so that people would not be crossing back and forth," Ryan said. "He signed a certification that those changes would be made. It is our allegation that is a result of the failure to do that in a way that was recommended." She added: "There was a situation presented on May 3 that resulted in this crash." A woman answering the phone at Lynnway declined to comment, and voice messages left with auction officials weren't immediately returned. Ryan said the operator of the Jeep will not face criminal charges even though he was driving with an expired driver's license. No arraignment date for Lamb has been scheduled, the district attorney's office said. The crash was investigated by the Middlesex District Attorney's Office, the Billerica Police Department, the Massachusetts State Police Collision Analysis and Reconstruction Section and OSHA. The accident has raised safety concerns at auto auctions, where hundreds of dealers and pedestrians mingle near vehicles that are continually driven though lanes. In the years before the incident, the National Auto Auction Association, of which Lynnway is a member, tried to address those concerns with safety training and programs designed to reward auctions with high safety standards. Former National Auto Auction Association President Jerry Hinton told Automotive News in October 2016 that safety was a top priority for the group, citing the implementation of a program created by KAR Auction Services Inc. as a standard across the association's membership. "A lot of auctions like Manheim created their own safety elements, but this dovetails together to provide a lot of [independently owned auction companies] with something that would have been very costly to develop themselves," Hinton said in the October 2016 interview. NAAA CEO Frank Hackett told Automotive News on Friday that the group's focus in the last few years has been more on safety than any other topic that the organization covers. According to the NAAA website, the Auction Safety Certification program, also known as Safe T. Sam, tops over 78,000 safety certified and recertified employees.